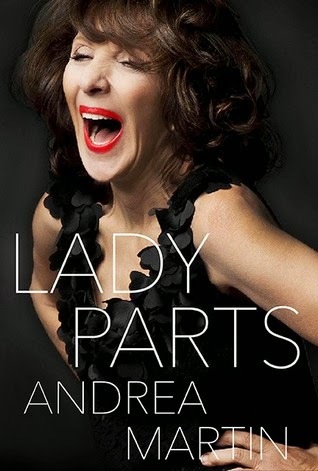 From Goodreads ~ Whether lighting up the small screen, stealing scenes on the big screen or starring on the stage, Andrea Martin has long entertained Canadians with her hilarious characterizations and heartwarming performances. An important player in SCTV, the funniest show ever to come out of Canada, Martin helped change the face of television by introducing us to a host of characters, including the indomitable Edith Prickley. Martin has worked stages, sets and even trapezes across North America, playing to houses packed with adoring fans, all of whom instantly recognize the star who has entertained us for nearly forty years. In Lady Parts, Martin, for the first time, shares her fondest remembrances of a life in show business, motherhood, relationships, no relationships, family, chimps in tutus, squirrels, and why she flies to Atlanta to get her hair cut. Martin opens up her heart in a series of eclectic, human, always entertaining and often moving essays. Lady Parts will make you giggle and may make you cry-a powerful collection of stories by a woman with a truly storied life. Andrea Martin is a star of TV, movies and stage. 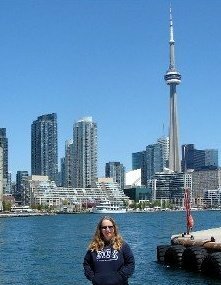 Though she was born in Maine, she has lived in Canada and now divides her time between the U.S. and Toronto. She is the oldest of three of Armenian parents, who split up when she was young. These are her stories ... of being married (and divorced) and a mom of two sons, dating, her mustang convertible (that was stolen at gun point! ), her friends, getting haircuts by Pascal Besimon in Atlanta, her battles with bulimia, SCTV and more. This was a fun book. I found it interesting and I liked the writing style. It was funny and honest. Though she sounds a bit neurotic, I bet she'd be fun to hang with ... she sounds very caring.